Is there a recipe for happiness? Meg certainly thinks so. 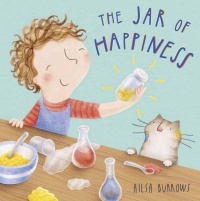 She collects all the necessary ingredients in a jar, which she uses to cheer up her friends and family when they’re feeling low. But what happens when her special jar mysteriously disappears? Will Meg feel sad forever more, or will she find other ways to be happy?